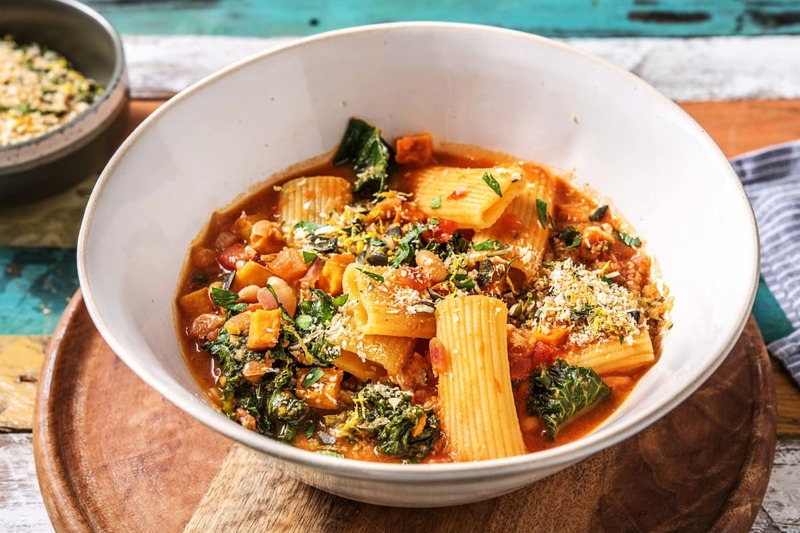 Chef Jesse has turned a customer favourite into a soup version of itself for the perfect Autumnal recipe. 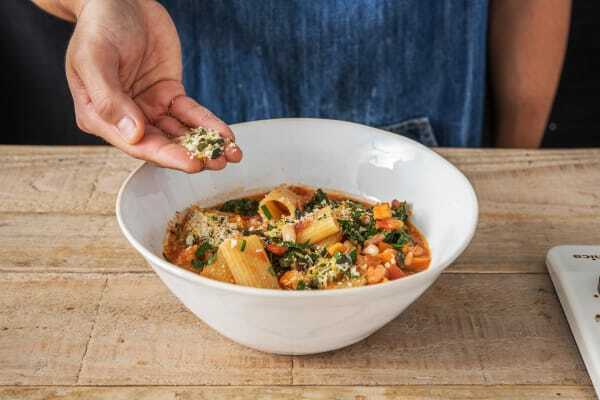 Packed with fresh vegetables, hearty cannellini beans, fresh herbs and rigatoni, this is bowl food at its best. Finish everything off by topping it with a crunchy blend of panko breadcrumbs and seeds, for a winning texture you can’t beat. Preheat your oven to 200C and put a large saucepan of water with a pinch of salt on to boil for the pasta. Halve, peel and chop the onion into small pieces. Peel and grate the garlic (or use a garlic press). Pick the rosemary leaves from their stalks and roughly chop (discard the stalks). 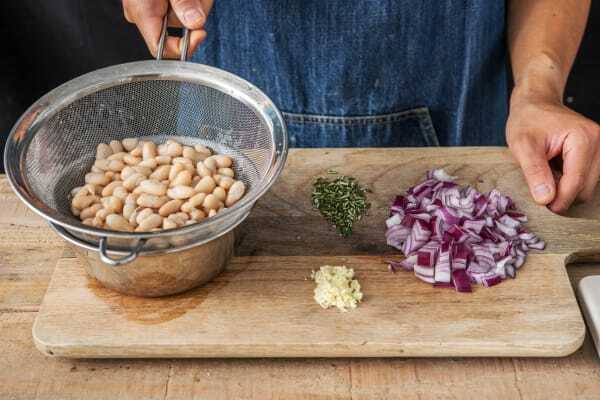 Drain and rinse the cannellini beans in a sieve. 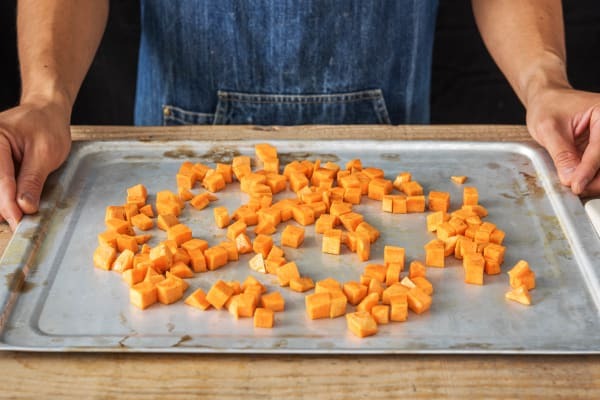 Place the diced sweet potato into a mixing bowl and add the honey and a drizzle of oil. Season with salt and pepper and toss to coat. Spread onto a lined baking tray and roast, turning halfway through cooking, 15-20 mins. 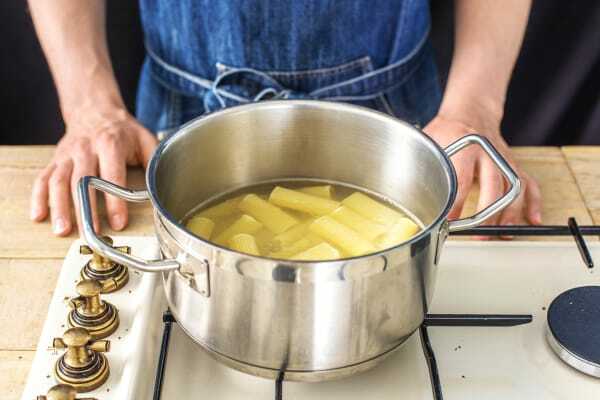 TIP: The potato is cooked when you can easily slip a knife through. 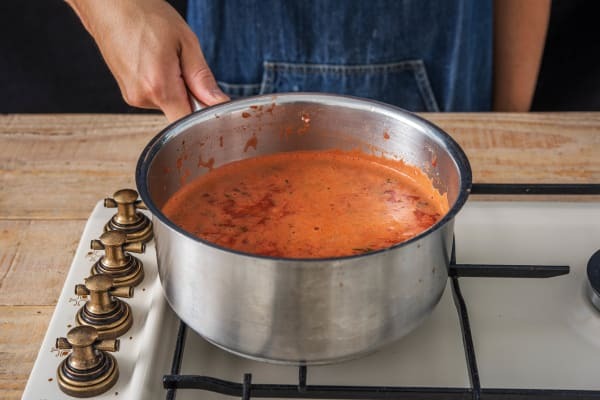 If cooked before the rest of the soup, remove from the oven and place to one side. Don't worry, it will wait! Add the rigatoni to the pan of boiling water and cook until al dente, around 11 mins. TIP: ‘Al dente’ simply means the pasta is cooked through but has a tiny bit of firmness left in the middle. Drain in a colander, drizzle with a little oil, and set aside. While the pasta is cooking, heat a drizzle of oil in another large saucepan on medium heat and add the onion. Cook until soft and starting to colour, stirring occasionally, 6-7 mins. Once the onion is soft, add the garlic and rosemary. Cook for one minute. Add the beans, tomato purée, chopped tomatoes, stock powder and water (see ingredients for amount). Stir to dissolve the stock powder and bring to the boil, then reduce the heat. Simmer for 10 mins, then stir in the cooked rigatoni and the kale. Gently cook until the kale has softened, 3-5 mins. Stir in the sweet potato and warm through, 1 minute more. Meanwhile, heat a drizzle of oil in a small frying pan on medium heat. When hot, add the panko breadcrumbs, stir regularly until they turn golden brown, 3-4 mins. Remove from the heat and transfer to a bowl. Roughly chop the pumpkin seeds and parsley( stalks and all). Zest the lemon. Mix the pumpkin seeds, half the parsley and the lemon zest into the panko breadcrumbs, along with a good pinch of salt and plenty of pepper. Set aside. Stir the remaining parsley into the soup and season to taste with salt and pepper. 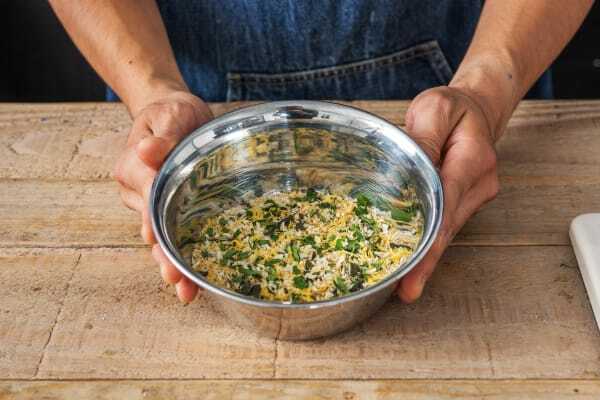 Serve in bowls with a large handful of the crumb mixture on top. Enjoy! This bowl looks amazing! Great job. Why not share a #HelloFreshSnap with your friends and family?